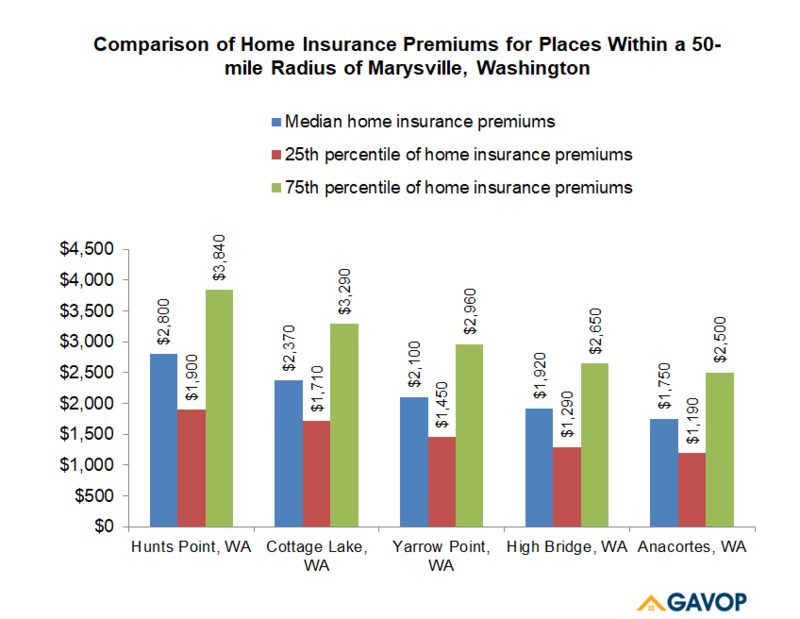 Gavop’s study of home insurance prices in Marysville, Washington, shows that the typical home value in the city is $250,800, the median home insurance cost is $1,280, and the savings between the 25th and 75th percentiles of insurance premiums are $820. In comparison, a typical home in the state of Washington costs $272,900, the median home insurance value is $1,560, and the savings between the 25th and 75th percentiles of insurance premiums are $1,020. For this analysis, Gavop studied insurance premiums of homes typically ranging between $100,000 and $1,000,000 in value, located within a 50-mile radius of Marysville. Typical home values, median home insurance premiums, and the savings between the 25th and 75th percentiles of insurance premiums in the city, state, county, and 10 areas around Marysville have been compared. Residents of Hunts Point can earn the highest potential savings of $1,940 on insurance premiums, with a typical home value of $1,000,000 and a median home insurance cost of $2,800. Cottage Lake comes second: its residents make savings of $1,580, with a typical home value of $564,000, and median home insurance of $2,370. Yarrow Point is third on the list; its residents make savings of $1,510, with a typical home value similar to that of Hunts Point ($1 million), and a median home insurance cost of $2,100. Residents of High Bridge can earn the next highest savings in insurance premiums at $1,360. The typical home value and median insurance premium here are $492,000 and $1,920, respectively. Anacortes is fifth on the list with a potential savings of $1,310. The typical home value is $356,700, and the median premium is $1,750. The graph below compares the median insurance rates and the 25th and 75th percentiles of home insurance premiums for the above-mentioned locations. The table below provides a list of typical home values, median home insurance costs, the 25th, and 75th percentile insurance premiums, and the potential difference between the two percentiles. The information covers 10 places within a 50-mile radius of Marysville, Washington.